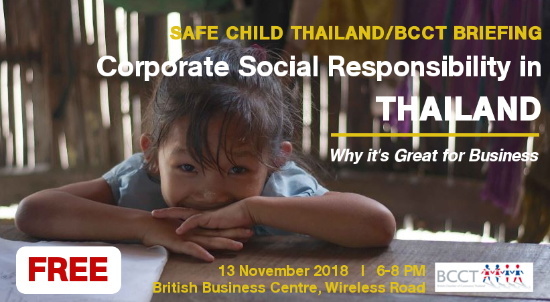 Safe Child Thailand is a charity that has been working to safeguard children across Thailand from neglect, abuse and exploitation for 35 years. We are in a unique position, having worked in the country for 35 years, we have a wealth of knowledge, experience and research data to inform our work going forward. We truly believe that we can make a difference to the lives of children living in Thailand. Topic: "Corporate Social Responsibility in Thailand; Why it’s Great for Business"
Cost: Free of charge. Pre-registration is required. Gemma Shaw is the Head of Fundraising at Safe Child Thailand. She has been working in Fundraising for the past seven years and has managed CSR partnerships with the likes of The Body Shop, Olympus, Allan and Ovary, Thai Leisure Group and The Lady Boys of Bangkok. She has had experience of managing CSR partnerships both in the UK and the Thai context.